If your kids are anything like mine, they tend to come home after school exhausted and HUNGRY! But with dinner a few hours away, it can be a challenge to whip something up that’s quick, healthy and not too filling. These are my favorite recipes that I found surfing the web and Pinterest. I tweaked some of them, so feel free to have fun and make them “your own”. My kids LOVE this and I am certain yours will too… no matter what age! 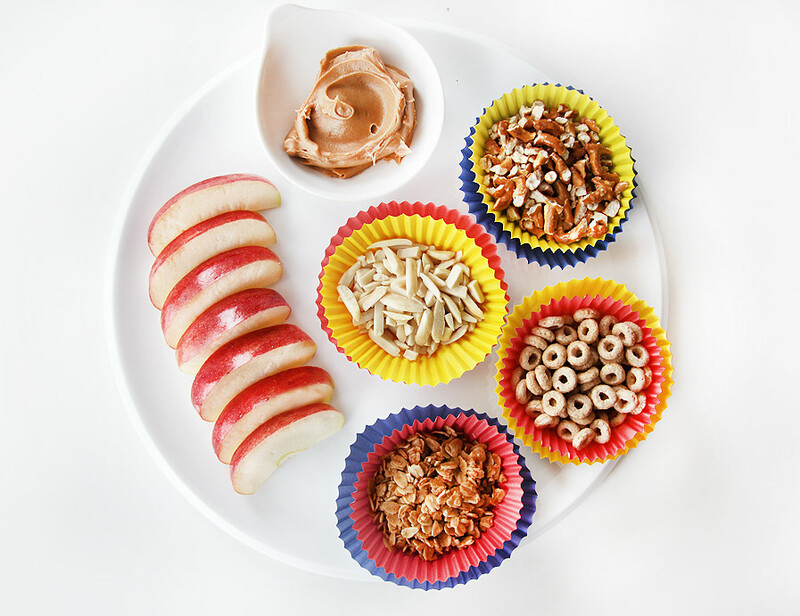 Slice an apple or two, fill a small bowl with peanut butter, lay them out on a plate and fill cupcake wrappers with fun toppings! I used cheerios, nuts, granola, and crushed pretzels. 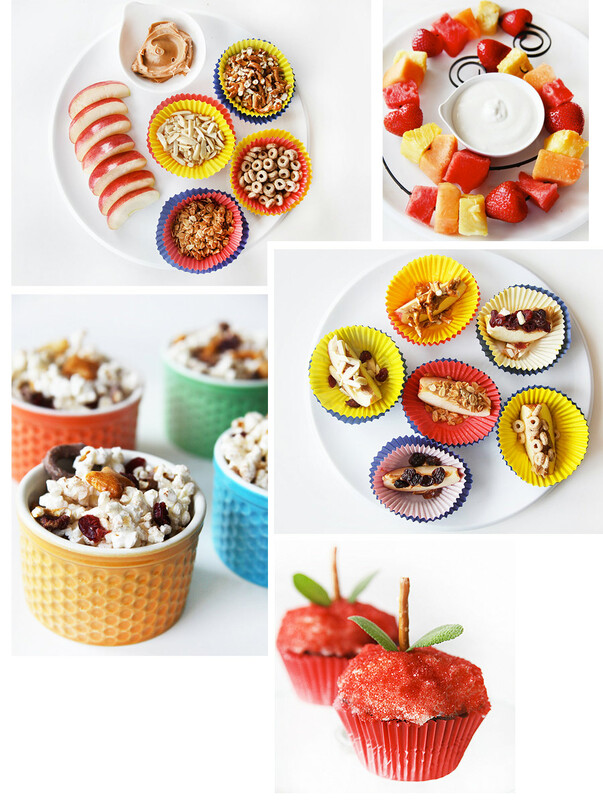 I’m sure you can come up with your own toppings that your kids will adore! Eating the apples are almost as fun as making them. Just dip the apple slice in the peanut butter, and add your favorite topping. If there are nut allergies, use caramel or yogurt instead of peanut butter. There are so many combinations, it’s all up to your imagination! 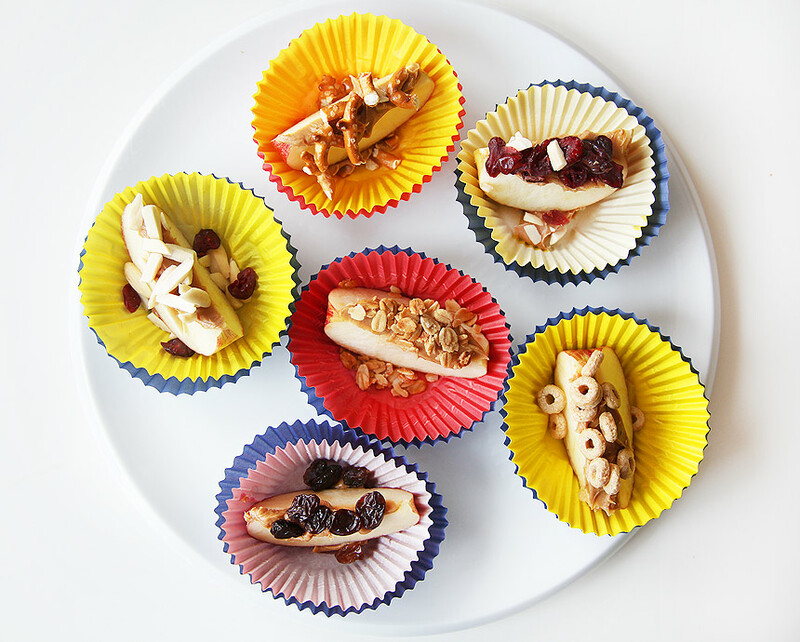 Another way to enjoy this fun idea is to put an apple slice in the cupcake holder, cover it with peanut butter and add your favorite toppings. 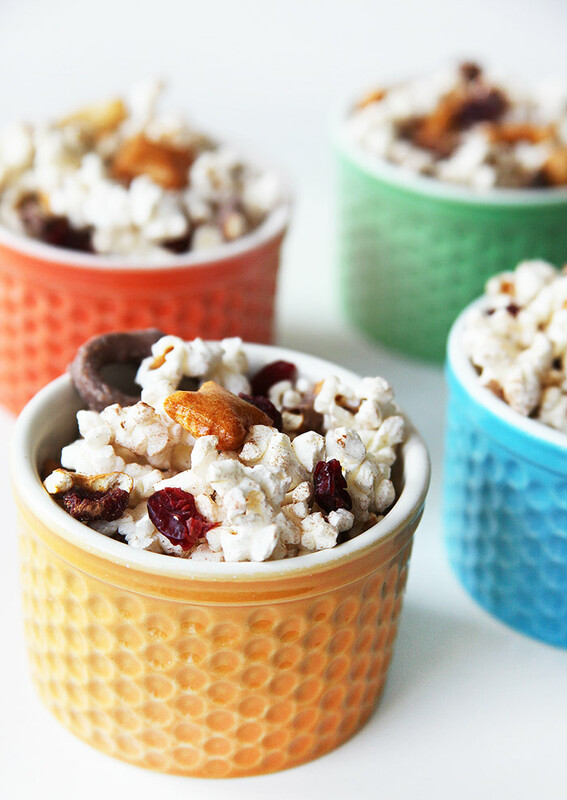 We added dried cranberries, raisins, and all the other toppings listed above. This happens to be one of my favorites! It’s easy to make and I typically purchase all my ingredients from the local Dollar Store. Which means, that I may spend $5 on all my ingredients, but I can make about 10 large bowls of snack mix… perfect for an afternoon snack, movie night, or even a casual party. Mix all the snack ingredients. In a small bowl, combine all the ingredients of the seasoning. Sprinkle the seasoning over the snack mix. 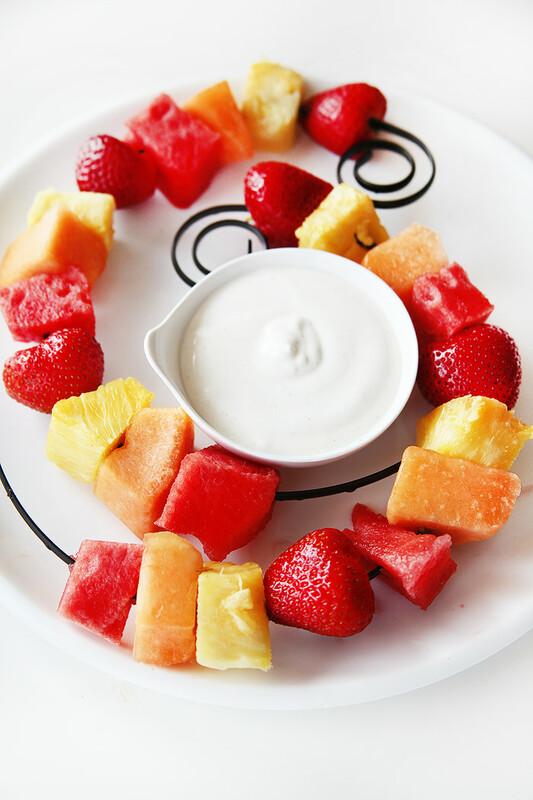 There are so many yummy fruit dips out there… some use marshmallow cream, other use cream cheese, while others use both!! If you are looking for a delicious and decadent fruit dip, just google “fruit dip” and you will see hundreds of recipes… some healthy and some not so healthy. My favorite is one that my mom has used for years which she learned from her mom. 1 cup of sour cream and 1/4 cup of sugar. If you need it a bit sweeter, add more sugar. This is a no fail recipe that has survived generations of fruit lovers! Okay, is it really possible to make a healthy cupcake? Well, probably not! However, the geniuses behind Hungry-girl.com certainly came pretty close. If you visit their web site, you’ll find a page filled with a variety of things to add to your cake mix to replace the oil and eggs. Diet soda, applesauce, yogurt, and more! I used applesauce and chocolate cake mix but I highly recommend you use white cake mix instead. For the list of great items to substitute, check out hungry-girl.com. It turned out yummy! Since I was sprinkling sugar on top of my frosting, I cut down on the sugar in the cream cheese frosting quite a bit. If you like your frosting sweet, I would suggest you double the amount I recommended in the recipe. Last but not least, all you “herb” lovers out there know that I used “sage” leaves to decorate my apple. Thanks to my local grocer, that’s all they had on their shelves. However, the leaves I would recommend to decorate your cupcake would be MINT! Well, that’s it! Enjoy your “healthier” cupcake! 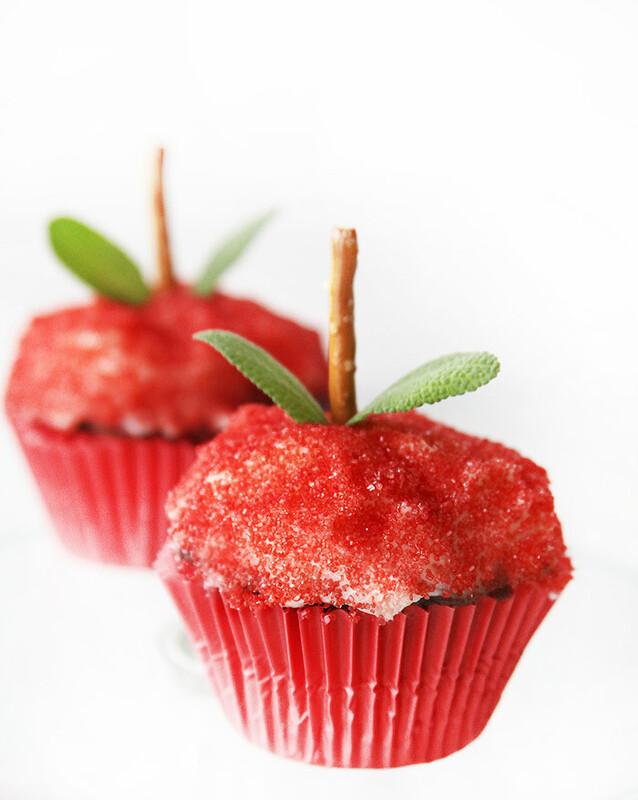 For the full cupcake and frosting recipe CLICK HERE.